An interested audience gathered in the Herbert Morgan War Memorial Building to hear discussions of veterans affairs. 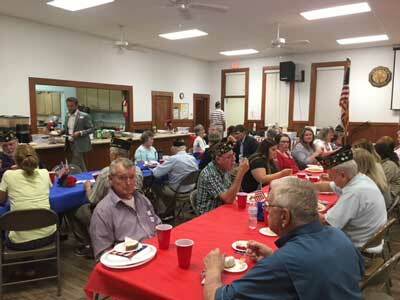 The August meeting of the Union County Republican Women’s Club was held jointly with Post 72 of the New Albany American Legion, and with the Post 72 Auxiliary Unit. They met on the evening of Monday, August 27, 2018, at the American Legion’s Herbert Morgan War Memorial Building. 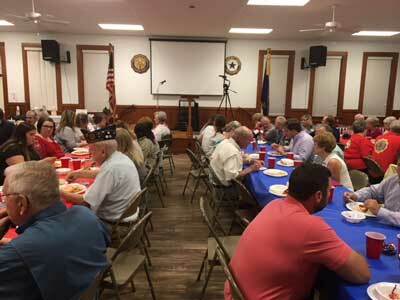 A large crowd attended the meeting, enjoyed a spaghetti dinner and heard from three speakers whose duties revolve around veteran affairs. Featured speaker of the evening was Stacy Pickeering, Executive Director of Mississippi’s Veterans Affairs Board. Mississipi Senator David Parker, of DeSoto County, who is Chairman of the MS Veterans Affairs Committee and Major General (Ret.) T. K. Moffett, of Tupelo, also addressed the audience. Possible action of disqualified candidate in another race still not known.